This is a guest post by Lorna Baxter. Ramadan2017 is estimated to fall on Friday 26th May and end on or around the Sunday 25th June. As a parent, it can be difficult to know how to approach this special time with children. It is important for Muslim children to feel the importance of such celebrations. 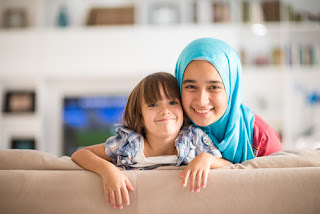 They may be in the minority amongst their class or friends at school that are celebrating Ramadan, so you want them to feel confident identifying themselves and comfortable talking about Ramadan; what it signifies and why it occurs. It’s really important to begin teaching your child about Ramadan from an early stage and make it relatable to them. Talk about child sponsorship and describe what children their age are suffering from. By using child sponsorship as an example, you make the issues more real to your child because they can see it for themselves. You should also explain the generosity of your actions during Ramadan. Knowing why they are participating in Ramadan and certain acts will give your child a better understanding of the whole process. Take the time to talk about your fasting experience, if your child is participating, ask them how their fast is going and discuss the challenges you each face. Being open about the difficulties reduces the pressure for your children and will stop them from becoming less enthusiastic. It’s also important to highlight the rewards and benefits of this month to your children so that they can recognise how privileged the month really is. Show empathy to them about their struggles during Ramadan to help support and encourage them. There are going to be certain times in the day that are more stressful than others for you and for your children during Ramadan. An important part of the process is identifying these times and setting up distractions to help ease any frustration. If you know that late afternoon is a difficult period for you, chances are it’s going to be a difficult time for your child too, so think of something fun for you both to do to distract yourselves. Trips to the park or afternoon walks are good activities to decrease irritability. You could also try some crafts and activities; or even better - fundraising ideas in a bid to help others during this prestigious month. If you are finding certain challenges in parenting during Ramadan, chances are, other parents may be struggling too. Talk to parents in similar situations and discuss your experiences - they could have strategies in place to ease difficult situations that you could try too. If you feel comfortable doing so, ask close acquaintances, or if you don’t wish to do this, connecting with new people online is a great way to find answers. Sometimes, it can be reassuring to know that other people are going through the same experience as you during Ramadan. Parenting is important, but it’s equally as important to take care of you during this time. Have some you time, even if it’s just a few minutes. Take some deep breaths, pray, recite, or just relax to become calm. Taking care of yourself is a vital part of being a good parent as your emotions will rub off on your children. They can sense when you’re anxious, nervous or frustrated, and it won’t help them to remain calm. You need to be happy and strong to have happy and strong children. Children always learn from example, and it’s good to remember that what your children do is a reflection of what you do. Children are also very adaptable, if a change is introduced in the correct way, they can adapt very quickly so don’t be afraid to try new parenting tricks and see if they work. The most important thing to do is pull together as a family and work as a unit to help you all stay on the right path and attain all your goals for an enjoyable Ramadan. I absolutely love this post. While there are several posts speaking about how to handle children, you also focused on mom. Yes, we couldn't handle things well, when we ourselves are frustrated. Happiness glows from a home where the mom is happy. Great tips sis, thank you for sharing! I love how you stated that we need to take care of ourselves as well- this is so important and something we don't often do! Such wonderful advice. Agree with everything you've said hehe 💗 I love the part of how you mentioned if it's a difficult time for you, chances are your child is going to feel that too - absolutely! Such great advice sis. I love how you made it both about how you can make Ramadan better for your children, but also for YOURSELF because that's the part that often gets left out! Beautiful written sister. From an non-mothers perspective, it was definitely an eye opener.